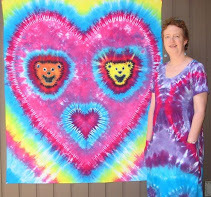 A while back I put a couple tie-dye projects on my home page when I thought I'd just be writing about tie-dye on my Amethistle website. Now that I'm writing about other things as well (Turkey and random subjects), it's time to tidy up the home page a little and make it more generic. As I started doing that, I thought about why I had chosen those projects to put on the home page (and why I'm moving them here). It turns out that my favorite tie-dye-related projects tend to be big, multi-phase projects, and they tend to involve enabling other people to do tie-dye. While I really enjoy doing my own tie-dye pieces, I also enjoy helping other people do it. Last year I was contacted by a woman who had gotten my name and wanted me to tie-dye her wedding dress. I'm a pretty hard-core tie-dye fan, but even I wouldn't think of doing that! I told her I didn't want to dye it--I definitely didn't want to take a chance on ruining somebody else's wedding dress! However, I was willing to teach her how to tie-dye it herself. That started what became many sessions of private tie-dyeing lessons. She got very enthusiastic about it, and she even brought her fiance and some of her friends to some sessions. By the time we were done she had dyed her wedding outfit and a backup outfit, the groom's pants, gifts for her wedding party, and shirts for half the attendees to wear to the wedding! The clothes and the wedding came out terrific. I made this tapestry as a wedding present for them (it now hangs in their baby's room). I did my dress, too, and wore it to the wedding (the bride's colors were "all of them!"). I love teaching people how to tie-dye, especially kids. Besides teaching tie-dye to individuals and friends, I've taught tie-dye at the elementary school, YMCA Family camp, Girl Scout meetings, and parties. May/June 2007 was the fourth year I've done tie-dye with the entire first grade at a local school. The kids love the shirts they made! We had about a hundred kids that year. I'm just getting ready to work with this year's batch of kids. I know they are getting excited about it (especially those with older siblings who did tie-dye with me before). Even though it's a huge amount of work, I can hardly wait!